With the snow on the ground it was time for some indoor comfort cooking with these Brown Sugar Glazed Pork Chops. They hit the spot every time we make them. Thanks to Shopease Foods for the awesome pork chops it really doesn't matter how we cook them we are always happy with the end result. 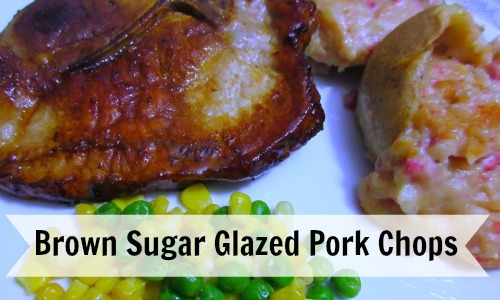 This recipe is perfect to glaze 4 pork chops. Mix the above ingredients all to combine well. If doing in a fry pan on the stove preheat the fry pan on medium heat before adding the pork chops. if doing in the oven preheat over to 350* and then cook pork chops in a shallow pan lightly greased for about 15 minutes on each side. Glaze one side of the pork chop and once it is cooked turn over and glaze the other side of the pork chop. Cooking time may vary depending on the thickness of the pork chops.